Snow begins to accumulate on Market Street late Wednesday morning, March 21, 2018. Sunday may be April Fool's Day, but it's no joke: snow is in the forecast. And expected accumulations in some areas of the Delaware Valley have inched higher. Snow will fall overnight Monday and make driving hazardous for the morning rush hour, according to the National Weather Service. 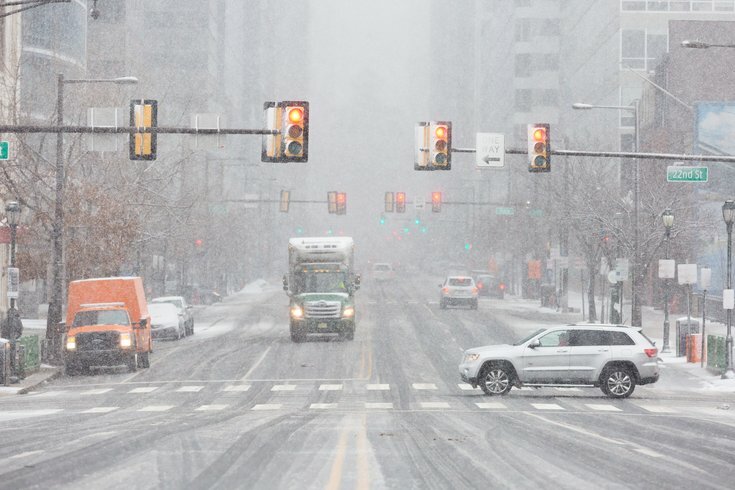 The northernmost and westernmost suburbs of Philadelphia could see as many as 3 inches, with 1-2 inches likely in the city and the westernmost parts of South Jersey, forecasters said. Less snow across much of the rest of South Jersey and the Jersey Shore. 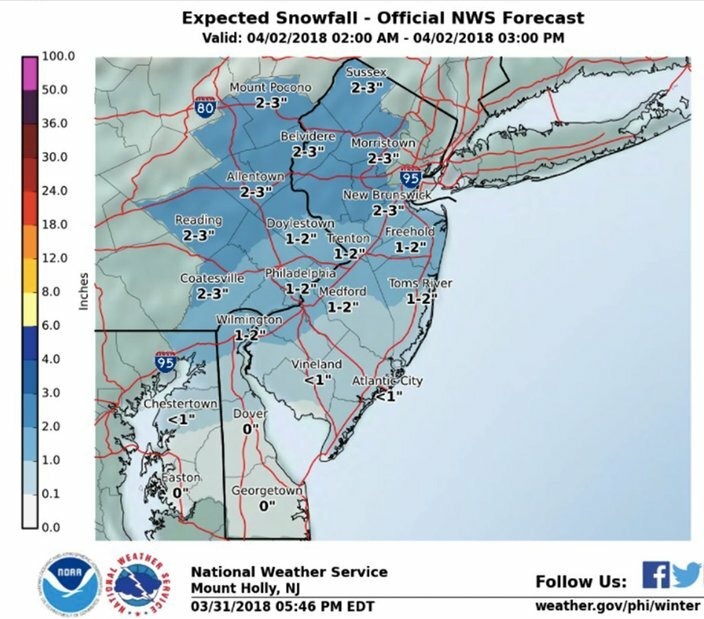 The precipitation could start – briefly – as rain across South Jersey and Delaware on Sunday night, plain old snow, or at the very least a rain/snow mix, is expected for areas along and north of I-195. High pressure across eastern Canada will force in enough cold air to allow a quick transition to all snow for just about all of the region during the late night hours Sunday night and into Monday morning. Snow from the quick-hitting storm will be heaviest in a 3- to 4-hour window between 3 and 10 a.m., depending on location, forecasters said Saturday night. Forecasters said the recent warm weather means it will be difficult for the snow to accumulate on roadways. But it will fall at a heavy enough rate in some places to allow accumulation. The snow, which tapers off Monday morning as the coast low tracks out to sea, won't be around long. Monday will be cold, but only compared to the normal high for early April. Highs will get into the mid and upper 40s, about 10 degrees below normal, but the temperatures should result in most, if not all, of the snow melting by sunset. Warmer temperatures will return Tuesday, but then it gets colder than normal the rest of the week. In fact, a clipper system could move out of southern Canada Friday and Saturday. It could dip far enough south to bring another round of precipitation across our region, but forecasters said there is considerable uncertainty with the track of the low. Saturday afternoon: Sunny, with a high near 58. South wind 6 to 9 mph. Saturday night: Increasing clouds, with a low around 43. Southwest wind around 10 mph. Sunday: Partly sunny, with a high near 61. West wind 8 to 13 mph. Sunday night: A chance of rain before midnight, then a chance of rain, snow, and sleet between midnight and 3 a.m., then snow likely thereafter. Increasing clouds, with a low around 35. Northwest wind around 6 mph becoming light and variable. Chance of precipitation is 70 percent. New snow and sleet accumulation of around an inch possible. Monday: Snow likely, possibly mixing with rain after 9 a.m., then gradually ending. Partly sunny, with a high near 48. Northeast wind 5 to 7 mph becoming northwest in the afternoon. Chance of precipitation is 60 percent. New snow accumulation of less than one inch possible. Monday night: A chance of rain, mainly after 9pm. Mostly cloudy, with a low around 36. Chance of precipitation is 50 percent. New precipitation amounts of less than a tenth of an inch possible. Tuesday: Rain likely. Cloudy, with a high near 55. Chance of precipitation is 70 percent. Tuesday night: A chance of rain. Mostly cloudy, with a low around 49. Chance of precipitation is 40 percent. Wednesday: Showers likely, mainly after noon. Mostly cloudy, with a high near 64. Chance of precipitation is 60 percent.